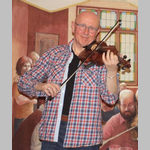 Tom McConville is a wonderful fiddle player and vocalist from Tyneside who brings a wealth of talent and experience to share with us tonight. This man is well respected by the many people he has worked with but I think his magic comes to the fore in front of a live audience as the tunes flow sometimes at break neck speed other times in a halting but beautiful slow air. His songs range from his beloved North East to the USA and beyond. Don’t worry, your contribution to the choruses will not be forgotten.